Make over your morning routine—and get that much-needed energy to last all day. “Your thoughts significantly impact your energy levels for the day,” says psychologist Elizabeth Lombardo, PhD, author of Better Than Perfect. If you could hold a microphone to your brain when you first wake up, what would it say? “It’s too early.” “I’m so stressed.” Flip the script to something more positive: “Today, xyz is going to bring me joy.” If you need a reminder, stick a note to your nightstand—it’s that important. Natural light flips your brain’s switch from sleepy to awake, says Abbott. “There is nothing better than sunlight,” she says. 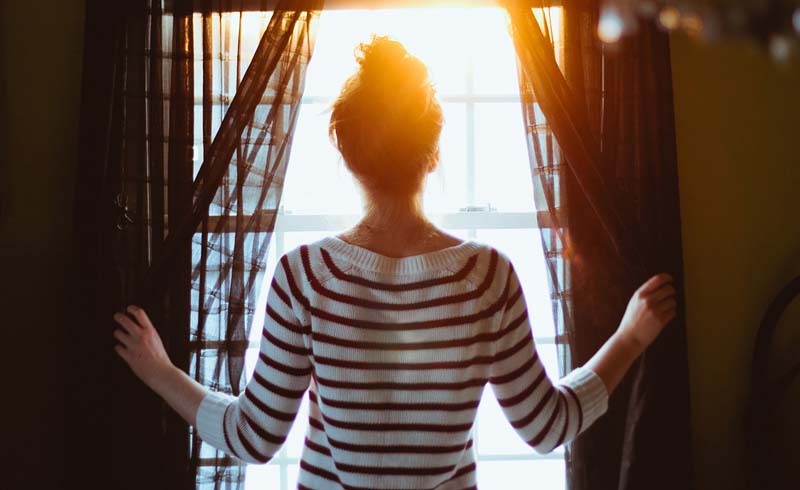 What’s more, a study published in the journal Sleep Health found that morning light exposure can help you snooze more soundly later that night, so you’ll likely feel better the next morning (and the next). If the sun’s rays are not an option because it’s still dark out, second best is turning on the lights to get as much bright light in the room as possible. Do 5 to 10 deep breaths and a few stretches: Reach overhead, gently twist from side to side, and bend forward to reach for your toes, suggests Carrie Jaworski, MD, director of primary care sports medicine with the NorthShore Orthopaedic Institute and medical director of the Hamilton Chicago cast. “This gets your big muscles moving and increases blood flow to the other parts of your body, which will wake you up,” she says. It pays to delay, says Abbott. “Because levels of stress hormones are highest when you first wake up, caffeine is more effective later in the morning, when those levels start to decrease,” she says. So have your first sip then. You’re most likely dehydrated from the long night, and being parched is an energy sapper, per a study in the Journal of Nutrition. Soon after you get up, knock back a big glass of H2O. Infusing water with a stimulating flavor, like mint or basil or ginger (add your ingredient of choice to a pitcher of water the night before), can also stave off fatigue, says Boston-based holistic health coach Kerri Axelrod. Carbs are your brain’s preferred fuel source, explains Abbott, so you can boost alertness by grabbing something like whole grain toast with almond butter (healthy fats are a great source of energy too) or low-sugar, high-fiber cereal topped with berries. Whole grains and berries are both full of fiber, which takes longer to digest. That means the energy you get from your breakfast will last, and you won’t crash and burn before you even get out the door. The mere act of making your bed can bring a sense of calm and take you out of sleepy-time mode, says Julie Morgenstern, author of Time Management from the Inside Out. Make it easy by getting a quilt that you can toss on top rather than blankets that need to be tucked in, she says. With practice, it’ll become a habit.